A rare blue parrot which was believed to be extinct in the wild has been spotted in Brazil for the first time in 15 years. A solitary Spix's Macaw was caught on video flying through trees in the state of Bahia. Pedro Develey, head of the Brazilian Society for the Conservation of Birds, said he believed it had been freed by a poacher trying to avoid arrest. A search of the area had just been concluded. 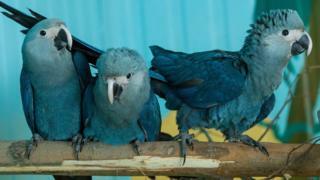 A colony of Spix's Macaw - the breed made famous in the animated "Rio" films - is being bred in Qatar and Brazil plans to reintroduce some of them into the wild. The latest sighting was made by residents in Curaca, Bahia. Mr Develey said the news was "amazing". "You should have seen the joy of the people when I got there, saying the macaw was back," he said. However, since the initial sighting, the whereabouts of the bird is unknown, the newspaper Estadao de Sao Paulo reported.